Cabin Fever can send you stark raving mad in the middle of winter. Click here to play! Cooped up at home with the same people, fireplace almost useless in keeping winter's icy fingers from chilling your bones... It can all become a bit much after 3 months of the same. If you think you have it bad, spare a thought for the poor bears of the Cabin Fever slots. If it wasn't bad enough that all their stores of fruit for the winter got frozen over when Junior opened the cupboard, they've also forgotten how to hibernate, with the new baby bear having learnt that everything can be a percussion instrument if you hit it hard enough. Junior and Mazey the bear don't make matters any easier for Mama and Papa, as they are constantly fighting over the TV remote. Mama blocks it out and passes the time on the phone to her sister, but Papa isn't looking so good these days. He spends all his time in a hot bath with a mug of beer, and his usually brown fur has gone all purple. Worse yet, Papa has started to hallucinate that a squirrel has come to steal his acorns. Cabin Fever sure has set in badly for the bear family. 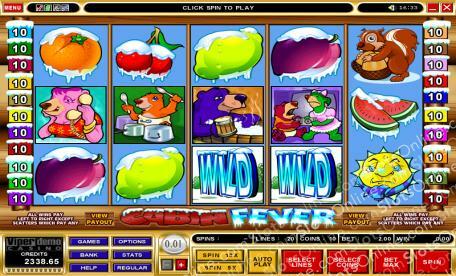 You can make sure you don't end up like the bears by instead playing the Cabin Fever slots. The Crazy Squirrel symbol is the main scatter symbol, paying prizes on the total bet when 2 or more are scattered on the reels. Also, the Grumpy Sun scatter symbol awards 20 free spins when it lands on reels 1 and 5, with doubled winnings for free spins. The Cold Wild symbol substitutes for any other symbol except for scatter symbols. It also doubles the wins of combinations in which it is substituting. There is a gamble option bonus game that can increase winnings on the standard slots game. In it, you can double your winnings by guessing whether a card will be red or black. If you guess incorrectly, the stake is lost, though.